Due to France’s defeat and occupation in 1940, the MAS-36 was one of the less-consequential rifles of WWII. However it ended up having a very long and diverse career after the war ended. The MAS-36 rifle was intended to be a common replacement for numerous existing French firearms, which in the mid-1930s dated back to World War One or even to the 19th century. Specifically, it was to replace the Mle.1886 Lebel rifle and the Berthier series of rifles and carbines. Development of the MAS-36 was started by the government-owned Ste. Etienne weapons factory in the early 1930s. Despite the weapon’s nomenclature, it was not in service in 1936 and in fact was still undergoing evaluations. Production of the MAS-36 did not begin until December 1938. Considering the political climate in Europe by that time, the initial production rate was lackadaisical and did not really ramp up until the summer of 1939. When WWII started in August 1939, a crash order was placed to try and catch up however when Germany invaded France in May 1940, there were not enough MAS-36s to go around and many French soldiers entered combat still armed with Lebels or Berthiers. The MAS-36 was a bolt-action rifle 3’4″ long, weighing 8 ¼ lbs.It fired the 7.5×54 mod.1929 cartridge from a stripper-fed internal 5-round magazine. It had a rated maximum range of 1,200 yards (about 0.65 miles) and was realistically accurate out to about 415 yards. The 17″ bayonet was somewhat clever. It was stowed horizontally in an internal tube under the barrel. A push-button activated a spring-loaded plunger which pushed it out of the tube. The soldier then turned it around and screwed it into the end of the tube for use. 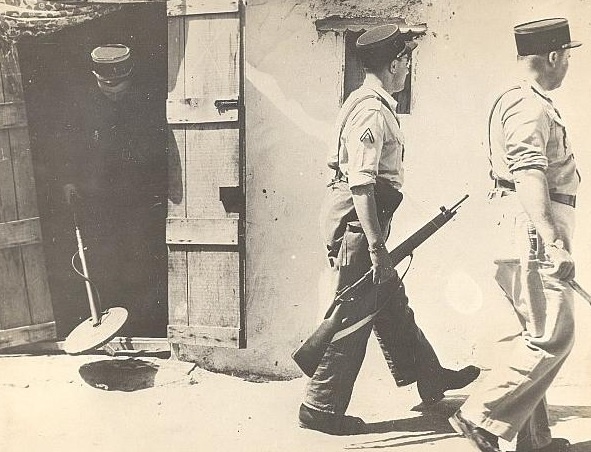 The inter-war French army tended to micromanage every detail of their soldier’s operations, and in this case it led to a very strong bayonet, as the MAS-36’s bayonet was commanded to be used both for charges and to probe the ground for mines, while all other bladed duties were instructed to be done with the soldier’s knife. 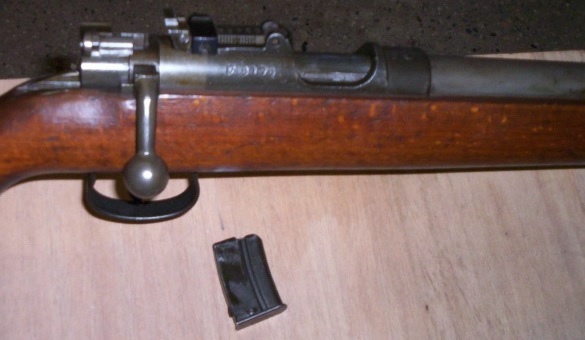 The MAS-36 had attachment points for a cloth sling and also an alternate forward attachment point for a cavalry-style sling (this is omitted on post-1945 built MAS-36s and was removed after WWII off some which had it originally). Whatever it’s battlefield limitations, the actual physical MAS-36 itself was immensely strong and could absorb rough treatment. The barrel was partially countersunk into the forward wooden furniture, giving added durability. There was a small peg near the muzzle so that three MAS-36s could be linked and stood up teepee-style. The choice of cartridge was one of the key elements of the rifle. The previous French service ammunition was the 8mm Lebel, an obsolete, awkward, and somewhat overpowered rimmed cartridge. Development of a rimless rifle cartridge had actually started in November 1918 but was not completed until 1924. This cartridge. 7.5mm mod.1924, failed it’s acceptance trials with the French army and was redesigned into the 7.5x54mm mod.1929, which was approved in early 1930. This cartridge used the 130-grain Balle C spitzer bullet and was successful. After all the tinkering, the final product was a very good cartridge with a respectable muzzle velocity of 2,700 fps. Unfortunately for the French logistics system, the MAS-36 shared it only with a handful of “oddball” guns, such as the Riebel machine gun and the Darne aircraft gun. The only post-WWII firearm to use this ammunition was the MAS-49 rifle. After WWII, France developed an improved version of this cartridge with a newer FMJ bullet which added an additional 1,000fps to the muzzle velocity and did more tissue damage. The nomenclature was not changed and pre-WWII and post-WWII rounds are fully interchangeable. 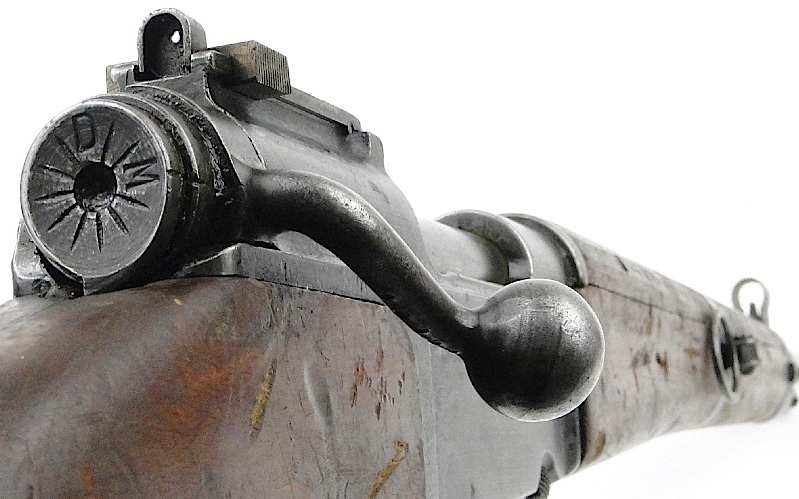 A distinguishing item was the MAS-36’s bolt handle, which was harshly angled forward, as opposed to the normal horizontal or slight rearwards-facing in most other bolt action rifles. The French felt that doing this would allow a quicker cycle back to battery, as the handle’s knob would meet the soldier’s hand immediately as he raised it from the triggerguard. This was true, however in service this “textbook” time savings of several fractions of a second really didn’t matter much. The MAS-36 was loaded with a metal 5-round stripper from the bottom. Once the clip was pulled out, cycling the bolt forward caught the top round, which was guided into the chamber by a follower. There was no safety of any kind. This was intentional, as the French army again chose to micromanage their soldiers. By regulation the MAS-36 was supposed to be carried unloaded. Upon an officer’s command, it was made ready, but, the soldier was only supposed to chamber a round right before firing. Obviously WWII showed this to be a terribly flawed concept and the lack of a safety was a major handicap for the MAS-36 after WWII. The rear peep sight was adjustable from 100 meters (328′) to 1,200 meters (1,312 yards) in hundred-meter increments. The front blade sight was housed inside a loop guard. The French army, again, micromanaged their soldiers in that they were not supposed to adjust the front sight. To ensure they didn’t try, the screws on the MAS-36 are a bizarre design, which require a special tool with a ⋅ ⋅ shaped point to turn. Almost all of these tools have been lost over the years and most collectors with MAS-36s today grind out the center part of a flathead screwdriver to make the necessary two prongs. There was originally only one variant. The MAS-36CR was intended for paratrooper use. It was shorter (2’3″ overall) and had a folding hollow stock of light aluminum. The stock was held in place by a spooled spring and activated by a locking latch on the tang. The sling was also of a lighter fabric, to squeeze every fraction of an ounce from the weight. Otherwise, the MAS-36CR was identical to the regular version. The felt recoil was, of course, harder. France did not conduct any airborne assaults before it was occupied by Germany in 1940. After WWII, the MAS-36CRs which survived the war were issued to airborne units, others were issued to regular infantry units (including the Foreign Legion), and others were transferred to allied countries where they were also used by regular infantry units. There was no real pattern. As mentioned, the French army was woefully unprepared for the German blitzkrieg of 1940 and not all units had MAS-36s. During the Dunkirk evacuation, Britain retrieved many encircled French troops along with their own. These evacuated troops had a mixture of MAS-36s, Berthiers, Lebels, and even a few still-older rifles. The French soldiers in England were divided into three groups: those loyal to Charles de Gaulle, the wounded, and those who wished to be sent back to France. From the latter two groups, any MAS-36s were transferred to de Gaulle’s Free French, while the older rifles from all three groups were given to the emergency British Home Army. Germany captured some MAS-36s intact and the gun was designated Gewehr 242(f) however because of it’s uncommon ammunition, very few were issued to the Wehrmacht. Most were kept warehoused in Germany until the spring of 1945, when they were issued to the hapless Volkssturm for the last-ditch fighting. There were instances when Free French troops advancing with the US Army into the Ruhr in 1945 recaptured MAS-36s which had been captured in 1940. The Vichy French puppet state retained the MAS-36 during it’s existence and actually started very slow-rate production during the occupation. The MAS-36s made in the Vichy years were of noticeably poorer quality. Meanwhile, troops in France’s far-flung empire, now marooned, also had a small number of MAS-36s. Finally of course, a few ended up in the hands of the French resistance. 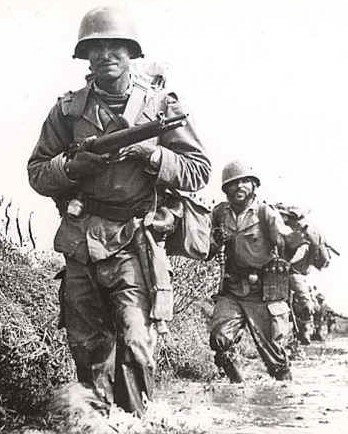 The Free French forces fighting alongside the British and American armies in Europe during 1944-1945 had already standardized on rifles from those countries. However all remaining MAS-36s in Free French service, plus those “liberated” in 1945, were transferred back to the reformed French national army. Ironically, in France’s overseas empire, the presence of the MAS-36 actually had increased during the war as Free French units took control of colonies such as Algeria, Madagascar, and Syria. 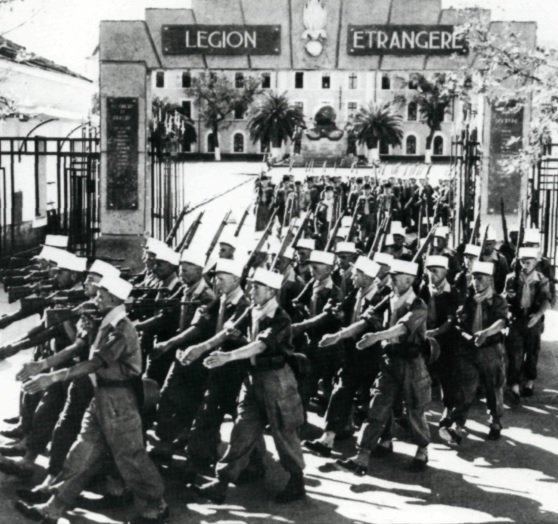 French garrisons in the overseas colonies retained the MAS-36 after the war. All of the MAS-36’s blueprints, production jigs, and even some parts escaped the war undamaged and France resumed production of the rifle in 1945. Besides post-1945 production of the basic MAS-36 there were two post-WWII variants. The first was the MAS-36 LG48, which was the basic rifle with an adapter to fire Mle.1948 50mm rifle grenades which were only usable on this rifle. The number of MAS-36 LG48s built is uncertain as they were completed and serial numbered as regular MAS-36s but then immediately converted. 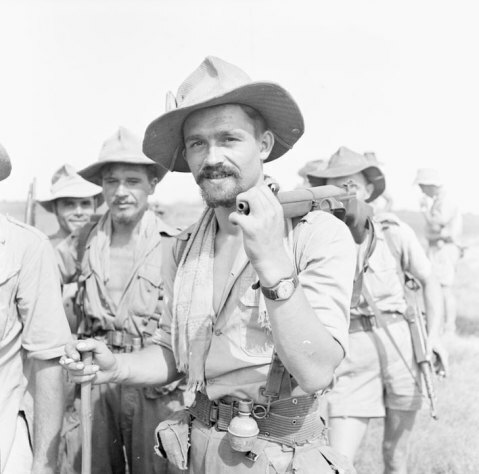 Most went to Indochina in the late 1940s/early 1950s, and a few were used during the Algerian war. The French army obsoleted both the 50mm grenade and the MAS-36 LG48 in 1962. The other, and much more common, postwar variant was the MAS-36/51. This was a MAS-36 fitted with a 22mm muzzle brake attachment to fire NATO-standard size 22mm rifle grenades. To use the rifle grenade, the MAS-36/51 was set on the ground at roughly a 45° angle, and sighted in bearing towards the target. A large forward grenade sight was popped up, and the soldier manipulated a worm gear which both adjusted the sight and altered the amount of chamber gas reaching the grenade, resulting in the correct ballistic arc if everything was right. The grenade was fired by a single blank cartridge. The most common rifle grenade was the French-made STRIM anti-personnel version, although there were armor-piercing, smoke, and tear gas versions available, plus the option to use American or Belgian 22mm rifle grenades. To use the armor-piercing version, the MAS-36/51 was fired in the normal shoulder position and a rubber buttpad was provided. This apparently did little to counter the tremendous recoil and this mode of operation was not popular. The MAS-36/51 could of course still be used as a basic rifle. A change from the prewar model was that the front sight was an open wing design, and the cavalry sling loop was deleted. This was the last new-build version of the MAS-36, with production running from 1951 to 1957. All combined, about 1.1 million MAS-36s were built between 1938-1957. 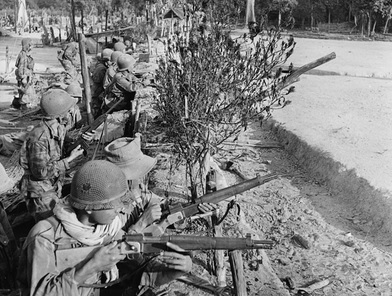 The first French units which landed in Indochina in 1945 after the Japanese surrender were armed with British SMLE and American M1 Garands. In 1946, postwar units relived them, largely armed with MAS-36s. Just as in France in 1940, the French forces in Indochina in the late 1940s did not receive enough MAS-36s to go around, and they were (ironically) supplemented by ex-German 98k rifles for some time. 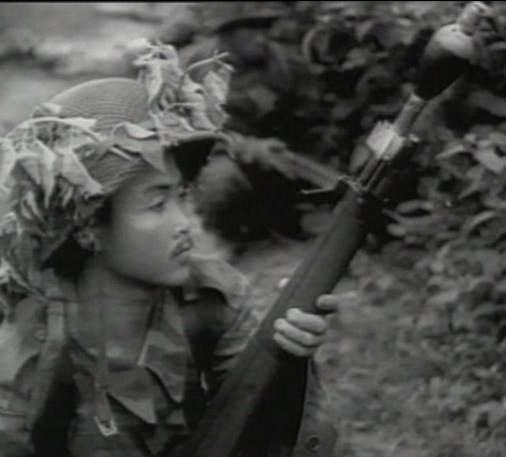 During the war’s early phases, the MAS-36 was adequate for the task as the Viet Minh communists were themselves largely limited to bolt-action rifles. As the war progressed, the communists began to introduce SKS and then AK-47 assault rifles, which outclassed the MAS-36. From 1950 onwards it was common to mix MAS-36s and post-WWII MAT-49 submachine guns. The war essentially ended with the May 1954 defeat at Dien Ben Phu. Already before this, French had begun to transfer MAS-36s to local Vietnamese, Cambodian, and Laotian forces. The communists captured large numbers of MAS-36 rifles during the war, both ad hoc battlefield captures and two large arsenal captures. These were put into service against their former French owners and when the war ended, transferred to the Viet Cong and North Vietnamese army. The MAS-36 was used heavily during this conflict, which started just as the Indochina war was ending. 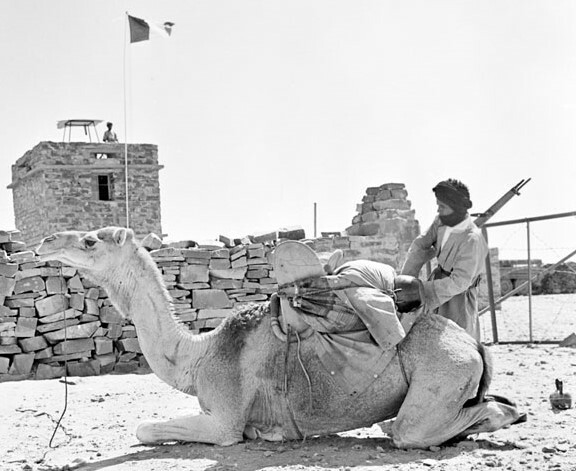 Especially in the first two years of the conflict, the MAS-36 was a main weapon of French forces, most notably with the French Foreign legion which bore the brunt of the fighting early on. The MAS-36 was also used by paratrooper units of the French army, who were generally used as ground infantry during the conflict. Just as in Indochina, the MAS-36 was usually complemented by post-WWII MAT-49 submachine guns. 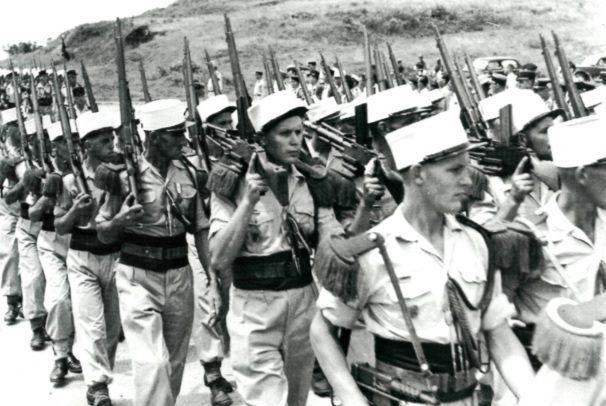 As more of the postwar MAS-49/56 semi-automatic rifle became available, the MAS-36s were either sent back to France or transferred to the 100,000+ “loyal” Algerians who bolstered the French forces during the conflict. 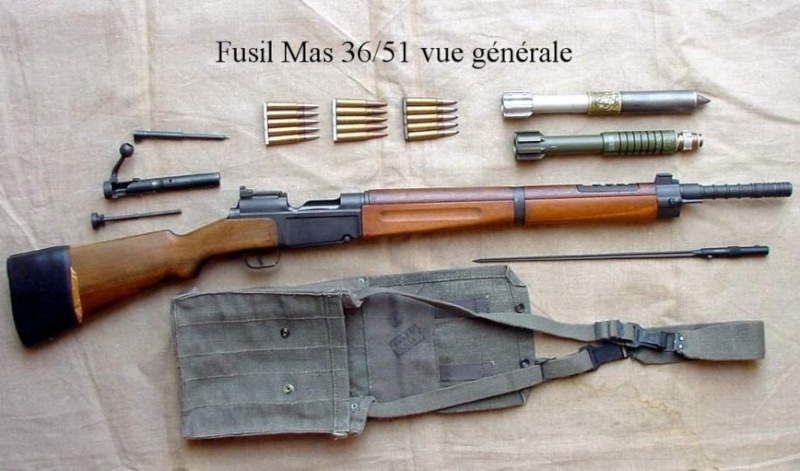 There was one version of the MAS-36 unique to the Algerian war, called the FUSTAN. 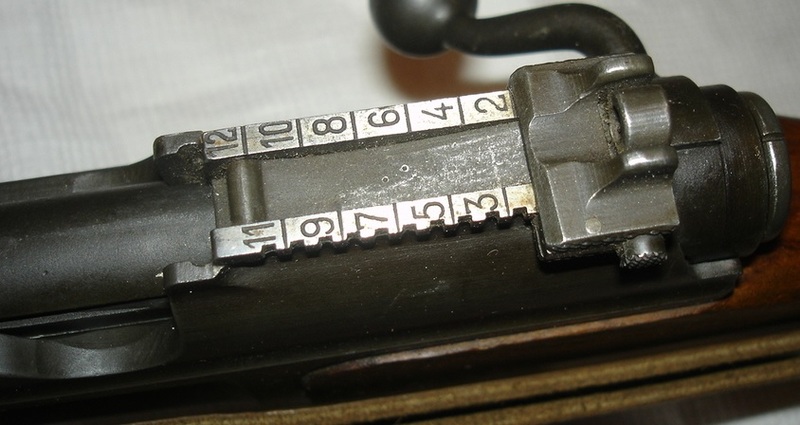 During WWII, the Vichy French government proposed a training version of the MAS-36 using .22LR ammunition, the supply of which was not restricted by the Germans. This was never proceeded with but after WWII, enough parts were found to manufacture 200 of these rifles, all of which were given to the North Africa Federation of Unions & Societies (FUSTAN in French) as a civilian marksmanship program in Algeria. The FUSTANs were counter-weighted to give the correct feel and balance of a regular MAS-36. They had no bayonet and the front sight was moved to the extreme end of the muzzle. Despite their unsuitability for combat these did see some use during the conflict. Almost all were destroyed or lost when France evacuated it’s citizens from Algeria. After the Algerian War ended in 1962, the French army rapidly began to phase out the MAS-36. Starting in 1950, the MAS-49/56 had begun to replace the MAS-36 as the standard service rifle. As the MAS-49/56 was the only other gun still in use that used the 7.5x54mm cartridge, it had priority to this ammunition. None the less, MAS-36s were still common in the French army through the mid-1960s, by which time these bolt-action WWII guns were woefully obsolete (consider that the US Army was using the M14 at that time, and most of the rest of NATO the FN FAL, while the Soviets were using the AK-47). By 1970, the MAS-36 was gone from frontline French service and relegated to second-line units or reserve armories. Many were transferred to the Gendarmerie, some to Penitentiare Nationale (prison guard service), and others allocated to storage for transfer to allied nations. The last record of any MAS-36 in French army custody was 1978, when it was officially obsoleted. 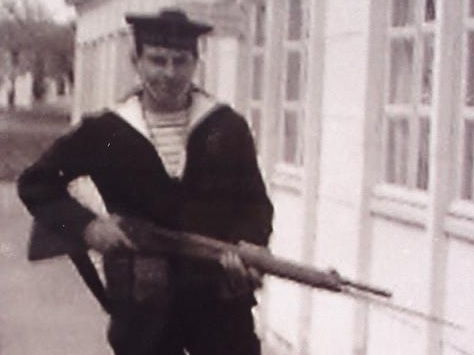 Meanwhile the French navy (which obviously had a much lower need for modern infantry rifles) also used the MAS-36 well into the Cold War, first as a service security weapon and then for second-line duties such as gate sentries and barracks watchstanders. The MAS-36 continued in this role into the late 1970s with the French navy. Aboard ship, a special version (rebuilt from existing examples) was used as a line-throwing gun. These line-throwing guns shot a blank cartridge firing an inert weighted grenade shape, which was attached to a spool of cord. They had a special attachment on the rear sight to gauge point-to-point distance. They were used during at-sea replenishment operations. A sailor aboard the replenishing ship fired the shape at the recipient ship, where it was retrieved on deck. The sailor then detached the cord and tied it to a heavier rope, which was then pulled over to the recipient ship. In turn, this heavier cord was used to bring over fuel hoses or resupply cables. These line-throwing MAS-36s were still in French navy use during Desert Storm in 1991 and some are still in storage as of 2015. A final version of the MAS-36 was the MAS-36TR. These had the action and barrel of the regular MAS-36, but refurbished and placed into a cheap one-piece wood body. They were rechambered to .22LR and fed from a 6-round magazine. The French navy used these guns to train recruits at boot camp. They served into the 1990s. Actually the 7.5x54mm was not that odd of a cartridge and was originally used in the very successful FM.24/29 light machinegun. After WWII it would not only be used in the MAS-44, MAS-49, and MAS-49/56, but also the AA-52 GPMG and MAS-36 derived FR-F1 sniper rifle. In the photo listed as “A unit of North Vietnamese communist fighters in 1953, armed with captured MAS-36 rifles” it appears my eyes that they are armed with PPSh sub-machine guns. Note how their left hands are gripping the magazine extending vertically from the gun.